We’ve been catless now for more than a year. 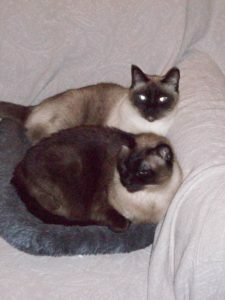 It’s been tough for me to get over; I fell in love with our pair of Siamese cats, Chyna and Buster, and their passing left a gaping wound in my heart. Finally, we’re done with travel — where both of us will be gone — for a few months, so this seems like a good time to get cats and allow them to settle in with us. Including T’s tabby boys — Scout and Smokey — we’ve had cats in the house for well over twenty years, so being without now for twenty months has made the house seem quiet and empty. We still haven’t finished cat-proofing the house, but I think that’s something that will have to happen on the fly, as it’s tough to determine just what new cats will fancy that they shouldn’t until it happens. I didn’t think I would like cats much until I lived with one. Her name was Cassie, and she was a lovely Tortoiseshell girl that loved being a lap cat, and loved people. She was a decent momma-cat too, when two kittens were adopted later. Sadly, both of those kittens turned out to be Feline Leukemia positive, and Cassie, being older, was the first victim of the disease in later years. She was a very sweet, very personable cat — just like Chyna and Buster — and, though due to a breakup I hadn’t seen Cassie for several years when she died, I’m still sad about the loss of her companionship, even thirty years later. Lots of baggage for me to sort through in adopting new pets. We’ve been looking around at several local adoption websites. We’d prefer to adopt a bonded pair of adult cats. One pair we were interested in got adopted before we could get our paperwork approved, but there are others out there, so we’re still looking. We’ve both done the kitten experience before; kittens are great, but we’d rather provide a home for adult cats – kittens are much easier to adopt out. We both loved our Siamese cats tremendously, so Siamese cats are high on the list, but it’s far from a deal-breaker if the cats are another breed. Personality and affection are more important to us than anything else. I’m sure I’ll post pictures once we have new cats in their forever home with us — like a proud poppa showing off — so you’ll meet them as soon as we get them settled in and comfortable with us. I’m recovering well enough from my fall a few weeks ago. Discovered the hard way that it isn’t yet time to wean myself off of Ibuprofen completely, though I have been able to scale down the number of doses per day. My back is mostly just stiff now, though I do get occasional twinges if I overdo things. Felt terrible that I wasn’t in good enough shape to help a number of friends who suffered severe flood damage in the past weeks, as record rainfall had creeks, storm drains, and watersheds filled to overflowing in mere hours. Hundreds of businesses in our part of Wisconsin have been closed for cleanup: many still haven’t reopened, and some probably never will. Thankfully, our home suffered no flood damage this time.